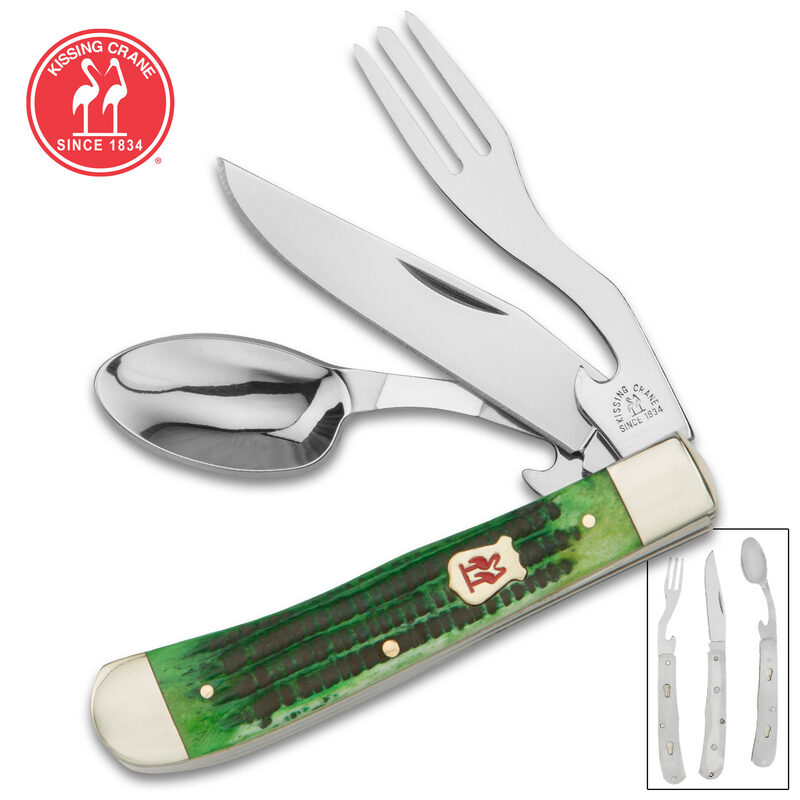 Kissing Crane Green Bone Camp Dining Tool - Genuine Jigged Bone, CrMoV17 Stainless Steel Utensils, Brass-Plated Bolsters, Separates Into Three Pieces - Closed Length 4 1/4" | BUDK.com - Knives & Swords At The Lowest Prices! This thing is great. Fits together perfectly, easy to take apart and use. The spoon isn't really tiny, in my opinion. It's not full sized, but it's no baby spoon either. The blade is razor sharp right out of the box. An all around handy little item. I bought this knife not knowing exactly what to expect. I was pleasantly surprised to see such quality in a $15 knife. With it's green scales this knife is more beautiful than the $100 Case hobo. 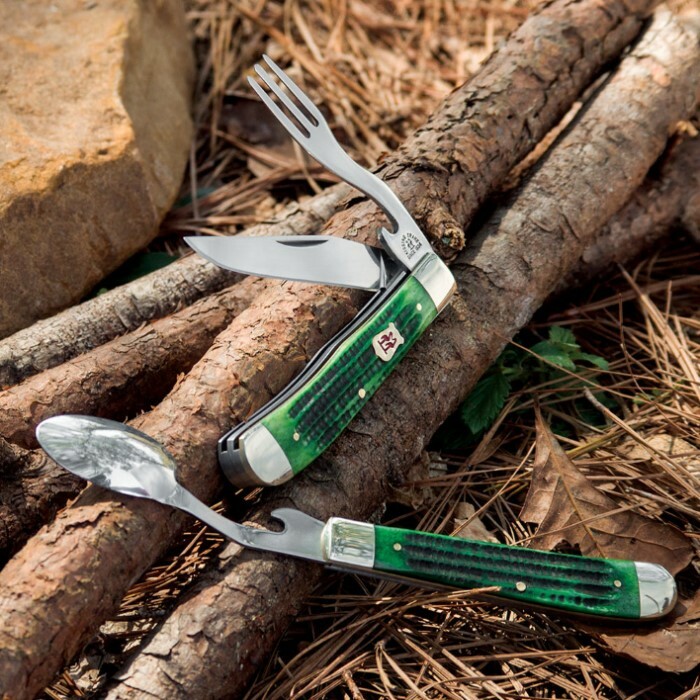 I have been carrying pocket knives for nearly 50 years and I know and appreciate quality. The walk & talk is like a bear trap! Sharp as hell straight out of the box. I am very happy with this knife! Thank you for keeping the great name of Kissing Crane alive and well!!! Got 2 of these during a bogo sale. Opened one it was fine, the other broke when I opened it the first time. Little stud used to hold it together fell out and disappeared, now the fork just falls off. Wish they came with a sheaths/covers (could use to hold broken one together). Guess I know why they were on sale. Heavier than you think it would be and spoon is on small side. Unfortunately the baby spoon comment was posted after I purchased this item. 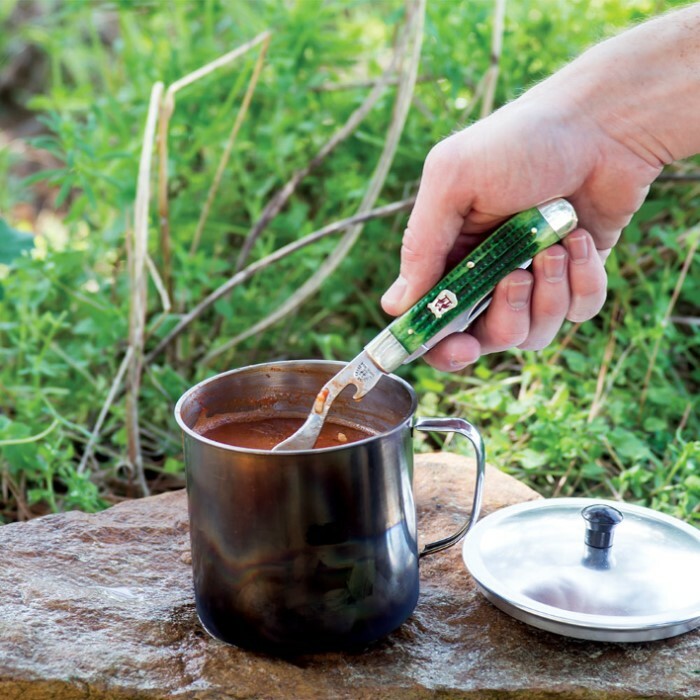 I completely agree that the size of the utensils makes this item useless...unless you took your baby hiking/camping with you. I'm surprised that no one had commented on the size of the spoon for example. It is smaller than a baby spoon. The quality of the item seems good but, if I'm trying to eat after a long day of hiking, I would go insane trying to eat my meal with this smaller than baby spoon. Maybe I was expecting too much but based on the reviews I expected something functional in the field. My first Kissing Crane purchase and I am very happy with it. Solid construction, works exactly as described. I didn't give it 5 stars because it doesn't throw sparks off my ferro rod, and the fork and knife are difficult to take out. Still very much worth buying. I just received the two green bone HOBO's ordered, I was amazed at the at the quality.The quality of the materials.the ,fit and fihish are equal to and possibly exceed a nearly exact one I paid $85.00 for.Thank you! I bought one yellow bone and one green bone. They are worth the money. There is a little gap in the back spring of the yellow bone knife. Great break apart design. A lot nicer than the cheap plastic handled HOBO's for similar prices. Overall satisfied with purchase.